Dienekes’ Anthropology Blog: Can we please abandon the concept of "effective population size" for admixed populations? Can we please abandon the concept of "effective population size" for admixed populations? We now know that admixture has been ubuiquitous in our species; not only recent admixture (which has affected South Asians and some Arabians), but also ancient admixture between modern humans and archaic ones. Admixture inflates perceived effective population sizes, making admixed populations appear "bigger" or "older" than unadmixed ones. It is no longer feasible to pretend that human evolution has been a nicely-behaved tree branching process. Nor is it feasible to pretend that patterns of modern variation were established at the time of Out of Africa. At every turn we've seen that ancient populations are different than modern ones. We have an increased appreciation of gene-language correleations and the influence of agro-pastoral dispersals (occurring in the last 10,000 years) in shaping modern human variation. And, while we're at it, let's not forget selection, which must have been more intense the further away from the ancestral human habitat. In short, there may very well be a pattern tracking an Out-of-Africa event in modern genetic variation -- if one overlooks a great number of confounding factors. For the first time, we provide specific effective sizes for a wide range of Old World populations in relative and absolute values (Table S4) and a number of interesting patterns are revealed. The populations with the largest sizes other than Sub-Saharan Africans are North Africans (Moroccans and Egyptians), due to their known Sub-Saharan admixture (Krings et al. 1999; Bosch et al. 2001; Brakez et al. 2001). Outside of Africa, the largest Ne is found in South Asia; only recently, the high internal diversity of Indian populations is being appreciated (Xing et al. 2010). Europeans and East Asians have similar Ne. Tibetans and Basques showed the lowest values, a direct measure of small population size and isolation. The information left by recombination in our genomes can be used to make inferences on our recent evolutionary history. Specifically, the number of past recombination events in a population sample is a function of its effective population size (Ne). We have applied a method, IRiS, to detect specific past recombination events in 30 Old World populations to infer their Ne. We have found that Sub-Saharan African populations have an Ne that is ∼ 4 times greater than those of non-African populations and that outside of Africa, South Asian populations had the largest Ne. We also observe that the patterns of recombinational diversity of these populations correlate with distance out of Africa if that distance is measured along a path crossing South Arabia. No such correlation is found through a Sinai route, suggesting that anatomically modern humans first left Africa through the Bab-el-Mandeb strait rather than through present Egypt. So, how accurate are the paper's conclusions? Regarding the clustering analysis (Figure 4), K=2 clearly separates African and non-African populations. At K=3 three groups separate: Sub-Saharan Africans, Europeans and populations from the Middle East and North Africa, and East Asians. Indians, Mexicans and two of the Central Eurasian populations appear as admixed between East Asians and Europeans. Egypt and Morocco show a greater Sub-Saharan African contribution than any other of the Middle Eastern populations. Finally, At K=4, the Indian populations have a specific cluster and are separated from the rest, something that did not happen in the SNP-based analysis. At K=5, the new component is restricted to European, Middle Eastern, and North African populations with an apparently random distribution (data not shown). Table 4 shows the fraction of ancestry for each population at K=4. The four clusters than can be assigned to four continental regions in which they are predominant: an African Associated Ancestral Cluster (AAC) present in 93.5% on average in Sub-Saharan African populations, a West Eurasian AAC with 91.3% in European populations on average, an Indian AAC (68.6%) and an East Asian AAC (89.7%). The African AAC is present outside Sub-Saharan Africa populations in Morocco, Egypt, and Kuwait, and rare elsewhere. The West Eurasian AAC reaches its highest value in the Basques (95.5%), and makes an unexpected appearance in the East African Maasai (11.4%). The three Central Eurasian populations had complementary levels of West Eurasian and East Asian AAC; the former was predominant in the Tatar (79.6%), and the latter in the Uighur (62.1%) and Altaian (62.1%). The Indian AAC was more frequent in the two Southern Indian populations, namely the Parayar (78%) and Cape Nadar (80.3%), while in the Gujarati the West Eurasian AAC reached 33.7%, and in the Kalita it was the East Asian component that was somewhat elevated (23.4%). The Tibeto-Burman speaking Adi, although sampled in NE India, clustered closely with East Asia (91.6% East Asian AAC). The Indian AAC is present in non-negligible frequencies in the SE Asian Lao, and, more notably, in the Ati, an isolated Philippino population, part of a group of peoples of low stature and dark pigmentation called Negritos. Some known cases of mixed ancestry that are confirmed in the cluster analysis. 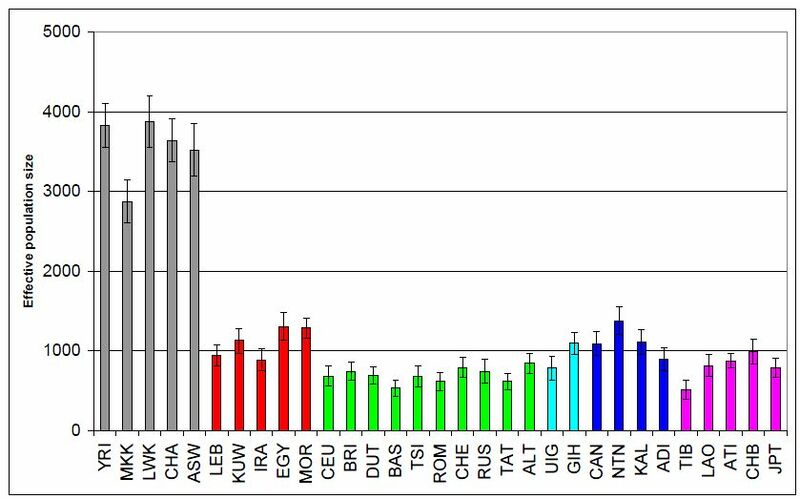 The West Eurasian AAC is present at low frequencies in African Americans; Spanish Gypsies appear mostly as West Eurasian (63.2%) but have a significant amount of Indian AAC (33.9 %). 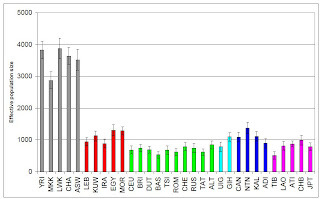 Finally, Mexicans contain contributions from the East Asian (55.5%) and West Eurasian (28.2%) AAC components. The Basques in this study come from Tolosa, Guipuzcoa and consists of a sample of 45 males according to Table S2 and Table S3. So how do the Basque K=4 clustering from Table-4 of this study correlate with your own analysis of French Basques from HGDP at K=4? Also how about the other European populations? Sure, it may very well be true for most AMHs - but there is little reason to believe it is true for all of them. And even less reason to believe the claimed time ordering. There is no reason to think at present that anatomically modern humans first left via southern Arabia. The first AMH outside Africa are from the Levant, not from Arabia, and the models from modern populations have absolutely nothing to say about >100ky Eurasians, they shouldn't even exist according to these models, hence they are said to have "become extinct" and fresh Out-of-Africa exodi are postulated after 100ky. OoA as currently envisioned is pretty much a broken theory that is trying to patch itself up by accommodating a little admixture here, a little admixture there, a little extinction here, a little inventive genetic geography to make Papuans appear admixed with Siberian hominins and Chinese with European ones. 2. A new theory that explains the data better than the patched up version of OoA. Even if effective population size is inflated in admixed populations, it still provides an upper bound which has a lot of practical applications if you are trying to figure out what kind of ecological impacts, population densities, founder effect relevance, and social structures could have existed in a concrete way. Population genetic models are not scale invariant, so it matters and is need to knwo information. Moreover, since admixture amounts and times can often be credibly estimated, the effective population sizes of the pre-admixed populations can also be inferred in a meaningful way, tightening the upper bound further. "There is no reason to think at present that anatomically modern humans first left via southern Arabia". In fact I have always believed it very unlikely. Good to see others with the same view. "2. A new theory that explains the data better than the patched up version of OoA". I think we can easily follow the spread and diversification of surviving haplogroups, but that fails to accomodate admixture events where one of the lineages became extinct, either immediately or (more likely) progressivley.